The next president could be stepping into a global recession and will have many obstacles to overcome in order for the United States to increase economic growth. “Make America Great Again” is a campaign slogan of one candidate, an ambiguous statement that implies transition back to the previous economic prosperity that this country once knew. One must ask, however, if this is actually achievable. Consider that post-WWII America contained less than 5% of the world population, but produced 50% of the global gross domestic product. This extreme growth was the result of America’s transition from an agricultural society into an industrial society, the impact of labor mobilization, and the power of women joining the workforce. The middle class of this time experienced wealth like no other middle class has ever known. Perhaps our current economic position is just the right sizing of our place in the global economy; the result of trade deals, globalization, mechanization, and technological innovation. It does not seem reasonable in the present time to assume America could experience such a level of global dominance. Many economists argue that to achieve such economic growth, something must be done to decrease the inequality that currently exists in this country. A recent report by the Federal Reserve Chair, Janet Yellen, estimates that the middle class has dropped from 25% to less than 14% of the population. Post-war, a high school graduate could go work for an assembly line with cradle to grave benefits, opportunities for advancement, and above market wages. Restoring the middle class of today will require improvement to our educational system and retraining of the labor market for the needs of the future. Anticipating the needs of the future will make the American people more adaptable. America needs at least 100,000 jobs to be created each month in order to just maintain the current rate of unemployment. If the president plans to make progress, he or she will need to create nearly half a million jobs a month. This task seems unachievable. Since the end of the last recession, America has had only two solid months with employment growth. Creating new jobs at the desired rate will require vast investment and restructuring of the current student debt crisis; individuals must be encouraged to pursue college without the fear of drowning in debt. For America to grow, the president must increase the availability of education and job training to the American people. In addition to the next president helping Americans find jobs, he or she must also increase the availability of housing. Housing is extremely important to the economy for several reasons. Development of housing creates numerous jobs in the field of construction. Furthermore, a home is the most valuable asset owned by the typical middle class household and the purchase of a home is usually financed with debt. However, increasing housing costs means increasing debt which makes the housing market more volatile. When problems occur in the housing market they can harm the entire financial sector. The president must increase housing through stable and efficient regulation. It can be argued that the largest problem facing this country is the ever increasing national debt. It is troubling that this topic has gained very little discussion in this presidential race. The national debt is well over 19 trillion dollars and is possibly the biggest threat to our economy. Some economists argue that the true amount of the debt is overstated because some of the debt is just one side of the government owing the other side. A primary contribution to this problem is that the US is a country that borrows money in its own currency from US and foreign investors. The currency is borrowed from entities who buy notes, bonds, and Treasury bills. Nonetheless, promises of social security and Medicare for the largest retirement population this country has ever witnessed are now due. It is this very reason that many economists argue that the true amount of the debt is grossly understated because future entitlement spending will be proportionally the largest slice of our national debt. American people have been actively mislead about social security, as it is the working adults of today that paid for retirees of yesterday. But who will pay for retirees of tomorrow? In order to tackle this massive debt, the share of income dedication to the debt payment must be increased. The debt to gross domestic product ratio must be stabilized in order to be made manageable. Attention to the national debt is not normally discussed unless it is during a financial crisis. The president must work to remove some of the unfunded liabilities and find a way to decrease defense spending without sacrificing national security. Yet the American people are endorsing proposals from both political parties that could greatly increase the national debt, such as building a wall or providing free education. If any of the candidates are serious about the national debt they should be proposing plans on how they will effectively manage discretionary spending, increase taxes, minimize defense spending, and fund future entitlements. Many American people often shriek at the idea of increasing tax rates, but it is unrealistic to assume we can manage the debt solely through economic growth. Increasing taxes seems inevitable because our income portion that is used to pay the debt is well below where it needs to be. Shortly after the financial crisis of 2008, the Federal Reserve slashed interest rates from over 4% to nearly 0% and initiated a practice known as quantitative easing. 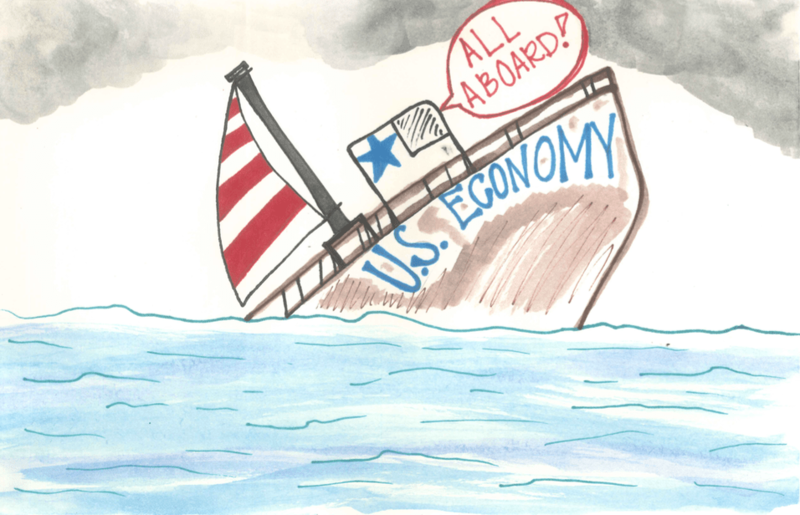 After these actions, top economists estimated quarter after quarter that the US would experience robust growth, but the growth we have experienced is anemic at best. However, it is difficult to estimate what the growth would have been without these changes in monetary policy because of the lack of a counterfactual. Conceivably a very terrifying issue that the next president could face would be a slowdown of global demand which could cause a global financial crisis. It seems inevitable that this is to happen and there are not many tools left in the monetary toolbox for the Federal Reserve to fight back because of the loose monetary policy that has been used to fight recessionary pressures. Contradictory to Keynesian economics, the country could tread into new territory with negative interest rates. The concept seems bizarre; imagine the bank charging you, rather than paying you, to hold your money. To overcome all of these challenges the next president will have to carefully plan and work to develop a strategy to promote the middle class. The American people must embrace change, work together and accept that they will only get a portion of what they want in order to increase the nation’s prosperity. We need a congress that is united, not one that is divided. The growth of our economy will be dependent on sacrifice and compromise, regardless of which political party is nominated into the White House.